Since Neither Here nor There is my first published book, this is the first time I’ve taken an interest in reviews as a writer. As a reader, I’ve skimmed through reviews to get an idea of whether I might be interested in a book. As a writer, reviews of my book become a lot more significant. They can vastly influence sales, and I want my book to sell because I want to become known as an author, I want people to enjoy reading it and to think about the issues raised in it and I want to make some money (although my expectations are realistic). So what do I want from a review? Well, it’s always nice to be praised, as long as the praise seems honest. But no book can be liked unequivocally by all readers. There will always be some who find something negative, be it the genre, the writing style, the plot, the characters, the level of editing. Even as I was writing Neither Here nor There, it was clear to me that readers who hold certain religious beliefs would have specifc problems with it. Esty, my heroine, is in the process of leaving one community for another. Clearly those who belong or are close to the community she is leaving will have problems with the story, despite the fact that I did my best to be fair to both. I’m sure there will be readers who have different problems with the novel, and I think all those problems should be reflected in the reviews. That’s why I’m pleased to have received my first non-five-star review, and why I hope there will be more. Although five-star reviews are welcome, too. More than welcome! I thoroughly enjoyed this book. It is well-written and kept me turning the pages to find out what would happen next. Esty, the main character, is very well-drawn and I was with her all the way as she struggles to establish her identity in a world which is new and puzzling to her. This novel achieves the often difficult balance of raising thought-provoking questions while, at the same time, providing an entertaining and satisfying read. The result is a poignant love story and more than that. I would definitely recommend it. I read this lovely book almost in one sitting (well, reclining, actually, since I was in bed). I was drawn in from the first sentence. Esty has spent all her 19 years in the strictly orthodox haredi community in Jerusalem but decides to leave it and her parents and many siblings. The decision is difficult and Esty is unprepared for what she will find on the secular side of the fence. The character of Esty is well-drawn and the author conveys very convincingly the anguish of being an outsider. This is a fluently-written, heart-warming story. 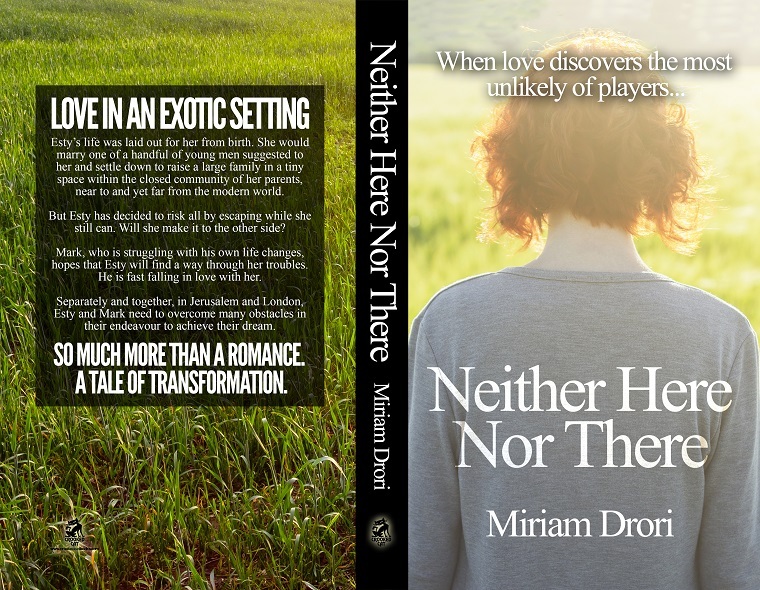 started reading miriam drori’s book NEITHER HERE NOR THERE and can’t put it down…love the characters…the writing and the story…her first-hand knowledge of the settings make them very real…a good book! A sweet, enjoyable romance that does a good job of portraying the angst of first love, especially when one is somewhat socially awkward and unsure of oneself. Many of us have been there and can identify with the hero and heroine. I have to admit that as an Orthodox Jew I had a problem with one of the dominant themes of the novel—Estee’s leaving her closed Orthodox community for secular “freedom”. I credit the author with trying to be even-handed, rather than taking sides, but must caution that some literary license was used in portraying Estee’s family’s community. This is a beautifully-written book, with believable characters and a very real sense of place (both in Jerusalem and London). Esty’s dilemma (torn between her loyalty to her family and her strong desire to follow her own path in life) is perfectly portrayed in a very readable and accessible way. Highly recommended. Reviews can be wonderful, especially those that sound like they really “get” your book. Yes. That makes all the work feel worthwhile. I know how reviews can be both gratifying and frightening. Well done on getting these. I look forward to reading and reviewing this myself but it must wait until I reach a break in my own writing. I can’t read when I’m working. No hurry, and no compulsion. Soon, I will take time off from everything in order to write. Thank you, Sue, for a lovely review.